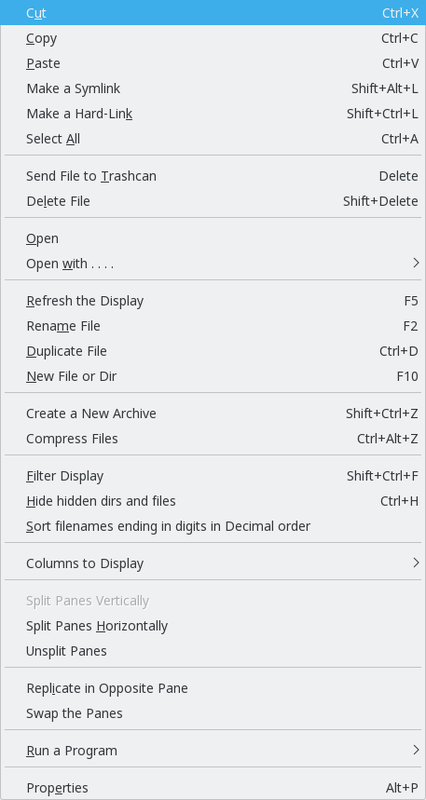 Right-clicking on a file or directory brings up a context menu, the content of which varies slightly, depending on the nature of the selected item. Many of its items are duplicated from the Edit, View and Archive menus, and have already been discussed there. There may also be Open and Open with... menu items that launch executable files, or open them with appropriate applications. Since 4Pane 5.0 a fileview context menu has an addition item, 'Sort filenames ending in digits in Decimal order', that requires some explanation. Consider a directory that contains files with names like foo1.png, foo2.png, foo11.png, foo12.png. These will normally display in a different order: 1, 11, 12, 2. For a few such files that won't matter, but what if the directory contains hundreds of numbered photos? Clicking this item will order them in a more natural way. Note that doing this will affect only the current fileview. Note also that it affects only files where the name ends in a number, not ones like f12oo.txt. The last menu item, Properties, opens the Properties dialog with the selected item's information.